Original complete 1979 American League Championship Series (ALCS) program from the Angels home games featuring Don Baylor on the cover. 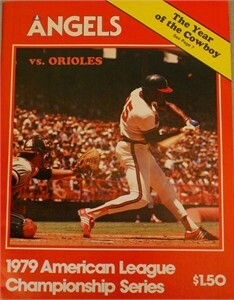 The Angels ended up losing to the Baltimore Orioles 3 games to 1. Has tiny tear on the bottom edge, otherwise nearly perfect condition. ONLY ONE AVAILABLE FOR SALE.